Action Duct Cleaning Co., Inc. Welcome, Marie, to the world of the lint-filled dryer duct – the seemingly innocent little tube filled with fluff that has become a major headache for many homeowners. You see, at the back of the dryer is an opening where the moisture from the clothes is discharged. Normally, the vapor is released into a four-inch wide duct connected to the dryer. This duct carries the moisture out of the building and into the atmosphere. Water collecting in the duct and dripping inside the building walls, floor or ceiling. Fire hazard (lint is quite flammable – more than 12,000 dryers catch fire each year, according to the National Fire Protection Association ). But it’s one of those maintenance tasks that easily get neglected until the dryer slowly begins to stop functioning. 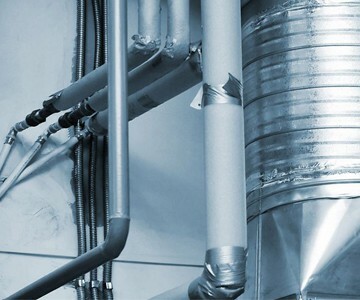 Many people solve this by hiring a duct cleaning company to do an annual cleaning. Apartment buildings have far more problems with dryer ducts than, for example, single-story homes. In a house the dryer duct sometimes runs a few feet to the outdoors. It may collect little lint and be easy to reach for cleaning. In an apartment building or condominium (and sometimes in larger homes), however, the laundry room is often a distance from an outside wall, meaning the dryer duct has to run through the wall, ceiling, and/or floor to reach the outdoors. It could even rise several stories to the roof. This allows greater opportunity for the lint to settle in the duct. And it’s no simple matter to clean 25 feet of duct in your ceiling! Another problem in apartment buildings is that the discharge end of the duct clogs easily. Sometimes the end is covered with a screen that catches lint until it is a solid barrier. Sometimes the end of the dryer duct is stuccoed over by careless contractors when the building is constructed or remodeled. This is far more common than you might think. Then there’s the occasional bird’s nest stuffed into the duct from the outside by our feathered friends. All of these things will give you a dryer that won’t dry. Disconnect the plastic dryer duct from the back of the dryer. Run the dryer with wet clothes in it. If the dryer now works and dries clothes quickly, the duct is the problem and needs cleaning. And hopefully, this will put an end to this hidden money waster and your saga of soggy clothes.